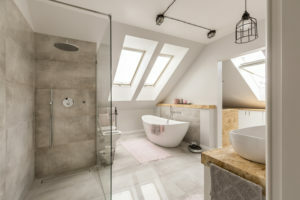 If this is the year that you are planning on remodeling a room, or maybe even are planning to build a new custom home altogether, we’ve got the latest design trends for you. Not every trend may fit the look and feel you want for your home makeover. 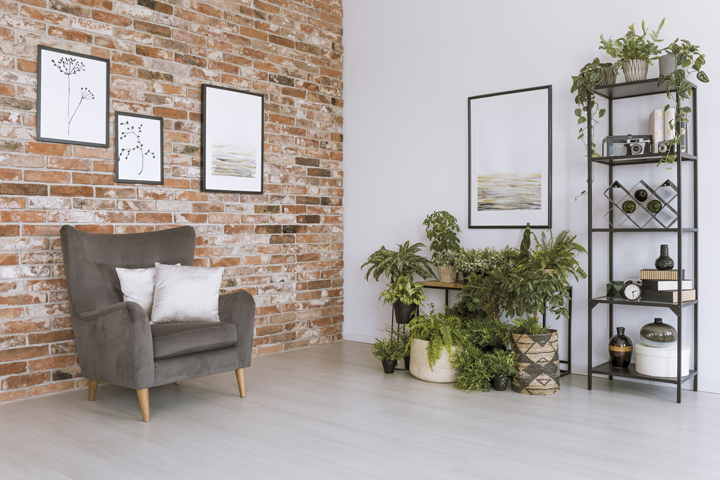 But these trends have a common appeal to homebuyers, meaning that they can add to the resale value of your home as modern and updated design elements often do. One of the best places to make renovations is in your kitchen. And one of the best things to upgrade first is your kitchen sink. Sinks repeatedly have a great return on investment as they are one of the first things that people notice. A good-looking sink can transform the whole kitchen. Rather than go with a stainless steel sink, more and more designs are leaning towards copper or granite sinks. Copper especially is a big contender as an attention-grabbing piece. But whatever material or texture you like for your sink, don’t be afraid to go big. We’re seeing more trough style sinks that are larger in size, sometimes even extending a little beyond counter space. Instead of solely neutral walls, homeowners this year are opting for more color to bring contrast to a room. Rich, darker hues are especially popular like forest green or charcoal. A splash of color can make walls, cabinet doors and more look brand new. It’s also an easier addition than some of these other trends. Contact a designer to help you pick the right contrasting colors that will also complement the furniture you have already. Bedrooms and oven range hoods may be two completely different elements of your home, but both can benefit from a “less is more” approach. Minimalism is trumping cluttered spaces for its calming atmosphere. Less furniture as well as less stylings, moldings or ornaments can make your master bedroom a more soothing place to sleep. But your oven range hood could also use a minimalist touch. 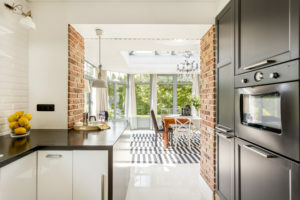 More range hood designs are adopting a solid rectangular look that blends in with the walls, sometimes paired with open shelves that meet right where the hood ends. This adds a beautiful, subtle look to the room while directing gazes to other attention-grabbing elements of your kitchen, like that new sink you’ve been eyeing. This next trend gives your lamps and lighting a new look by going vintage. Industrial-style lighting fixtures like copper and steel lamps are popping up in more and more homes. Like trough sinks, these lights bring a farmhouse feel that has become a major design trend over the last few years. Another trend we’re seeing are larger light fixtures. When looking to revamp the lighting of a room, don’t be afraid to try out bigger lamps or shades, to add a new element of contrast to the room. 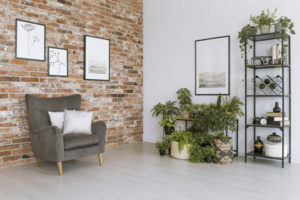 Sticking with industrial, many homes now are opting to showcase exposed brick walls and even sometimes exposed concrete. Used alongside these other trends, such textured walls give homes another touch of personality. If brick isn’t your style, look for other ways you can give rooms a different texture. Furnishings like a throw blanket with fringe combined with a smooth glass or brass coffee table can just as well juxtapose different textures, making the room more interesting when they are brought together. Tile is always a classy feature to include remodeled kitchens, bathrooms and elsewhere. This may be why it’s become so prevalent in today’s new custom homes. Patterned tiles, especially, with intricate designs look great as backsplashes. They work best when they act as a complement for your cupboards and other elements of your kitchen. Wallpaper is making a comeback for backsplashes, too, often in large floral patterns. Again, the trick is to make it all work together in a singular style and aesthetic. 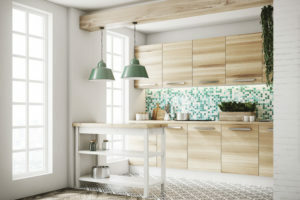 Work with a customer designer and contractor to learn how to make the perfect juxtaposition between your backsplashes and its surrounding features. 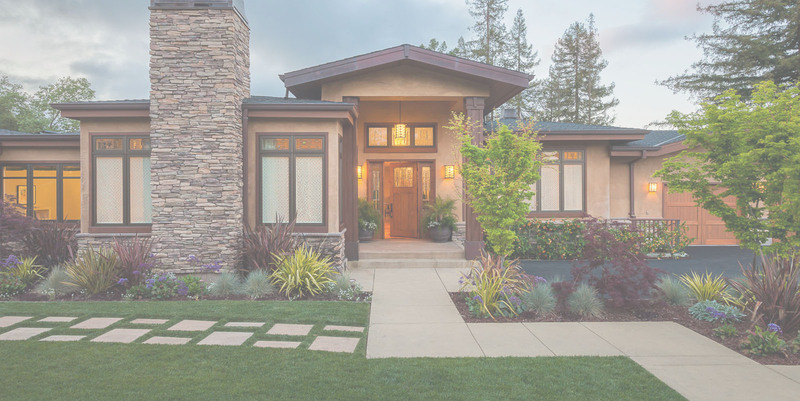 This final home design trend is built on the belief that one can never have too many windows. New homes are letting in more natural light with the addition of extra windows, especially larger windows. Windows can be appealing for many reasons, particularly if your property boasts some gorgeous views. They also can bring rooms a calming ambiance with softer light and nature scenes. Whether you’re in the market to build a custom home or to remodel your current home, adding a few more windows is a great way to lighten up and soften a room. Ask your contractor about any available energy-efficient window options that may help lower your home’s energy bills. Which of these latest trends most appeal to you? At the end of the day, how your new custom home or renovation should look is up to your decision. Some trends may not fall into the style that you prefer, and that’s okay! Pick and design the home that works best with what you want and what your home needs. If you’re wanting to build or renovate in Delmarva, call H&H Builders, Inc. for quality custom home builders and designers. We’ll work one-on-one with you to draft the perfect floor plan you envision for your new custom home or home renovations. Once you’re happy with the design, our construction team will give you the results you want in a timely manner and at a reasonable price. Contact us to learn more or to ask any questions about designing your home!